A Weekend Full of Sorry! Sadly, the weekend is over but at this time next week, Sara & TJ will be married! Woo-hoo. We’ll be heading back to NY next Fri morning – Monday morning. Wedding is at Marist College on September 5. Yesterday, I spend a decent amount of the day in the pool with Jay because it was a gazillion degrees and sunny outside (I’m not complaining, I love it). Afterwards, we went out to dinner with Clif at Champps at the Southpoint Mall in Durham. We walked around the mall a little afterwards, since we went to dinner at literally 4:45pm – whatever we were hungry. 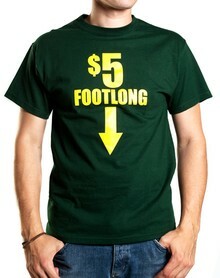 You know, just to show support for Subway, the sponsors of Chuck. It’s one of those buy-but-never-wear-out-of-the-house-shirts. Or is it? So Friday night, Jay got called into work at the very last minute. We were already on our way to dinner so I just kinda went right along with him and we ended up playing the game Sorry! for quite some time. Now I’m sorta obsessed with it. I need a life but games of chance like that are the best because they’re the only games I can beat Jay at. Clif’s been suckered into our weekend-long Sorry! tournament. It’s seriously been sorta…disturbing…how much time we’ve spent playing that game this weekend and how into it we get. And finally, I had a headache today so I slept for a while during the day then we finished up the weekend with some Hibachi food to celebrate Jay’s sister Heather’s birthday. <3 hibachi. This entry was posted in Clif Armstrong, Jay Glatfelter, Weekend and tagged 5 dollar footlong, Durham, novelty t-shirts, Sorry board game, Sorry!, Southpoint mall, Spencer's, Subway, t-shirts. Bookmark the permalink.